Danish physician; born in Copenhagen June 14, 1831; died there May 17, 1898. He studied at the Metropolitan School and at the University of Copenhagen (M. D. 1860). In the following year he published several clinical essays (of which "Ulcus Duodeni" was the most noteworthy), and became editor of "Ugeskrift for Læger," a medical journal, a position which he held until 1874. He was also for some years coeditor of "Nordisk Medicinsk Arkiv," to which he contributed valuable medical papers. In 1881 his alma mater conferred upon him the title of professor. 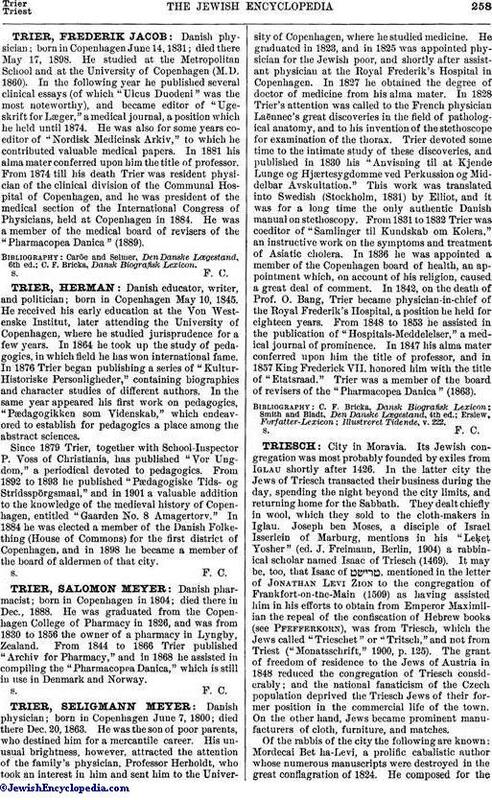 From 1874 till his death Trier was resident physician of the clinical division of the Communal Hospital of Copenhagen, and he was president of the medical section of the International Congress of Physicians, held at Copenhagen in 1884. He was a member of the medical board of revisers of the "Pharmacopea Danica" (1889).